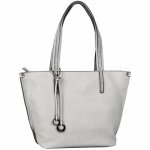 Gabor Cosima 7810 women's shopper bag. It features a high quality synthetic upper with contrast stitching and Gabor branding. The zip-top fastening provides added security for your belongings, while the internal and external zip pocket allows you to organise your belongings efficiently. A great style for everyday wear! 43 x 29 x 13cm (approx).